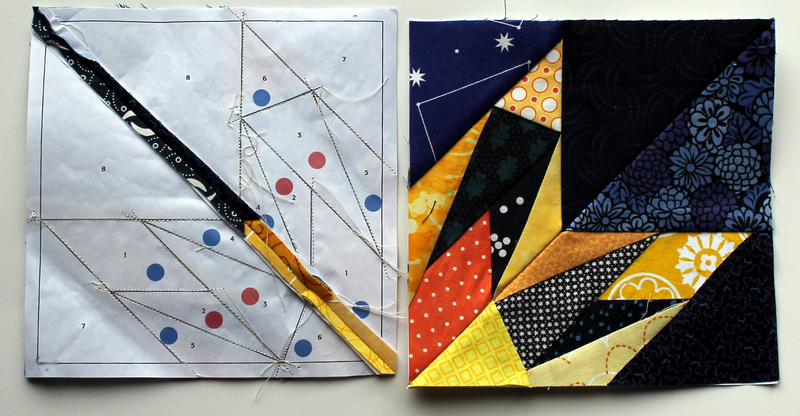 After a relaxing week off I am slowly getting back into the swing of quilting again…very slowly. 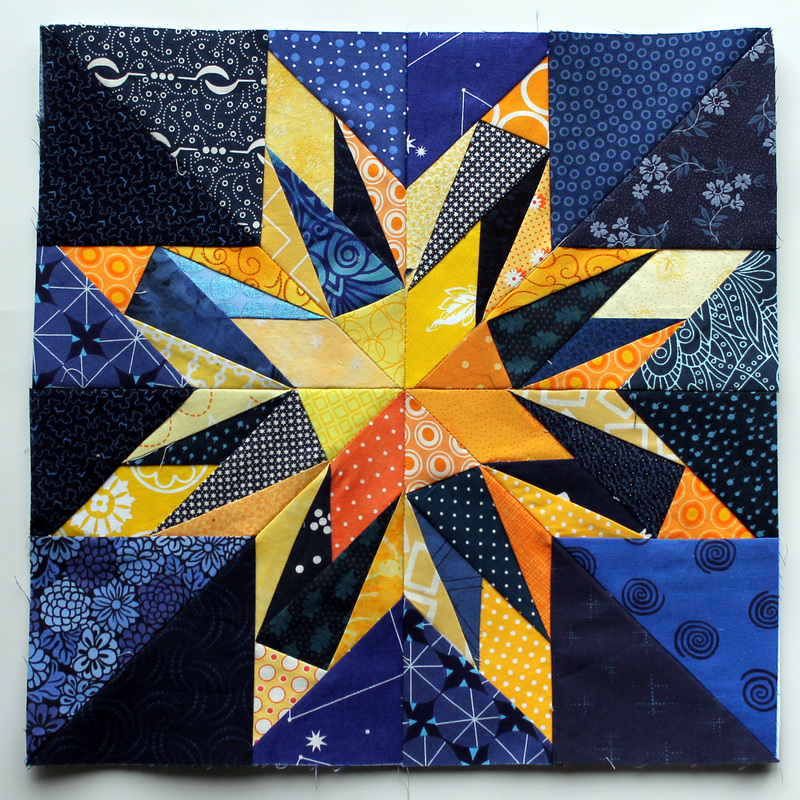 For this week’s paper piecing Monday I decided to do another Carol Doak star. I do love how this blocks look all fractured and broken but really beautiful at the same time. For this star I used the Washington Star pattern from my trusty copy of “50 Fabulous Paper Pieced Stars”. This block, and it’s 64 pieces was a real scrap buster. I did not cut one piece of fabric to make this block and just used bits and pieces from my scrap bin. This process made me realise I have way to many little bits of fabric….sorting thru my scrap bins is now on my “Things to Do in 2014” list. These stars are really turning out nicely! I envy your scrap bin – I like your blues and yellow/oranges. This is just beautiful! I really love the colours. But Kate I was only gone a week. I am really struggling to get back into the swing but it is slow going. See you Wednesday. Lol. Seemed longer! Most of my online friends shut up shop for Christmas, which is entirely reasonable of course, but I do so enjoy reading what people are up to, it’s become part of my morning routine. Gorgeous, perfect, I love it (as always)! Wow!!! This is stunning! I love it! But what lovely scraps! Nice work, I love it! Loving this latest star. I am particularly impressed with your fabric selection, it really strikes a chord with me. I am glad you like this block…I am really enjoying playing with these colours. Hi Cath, I’m new to your website and I love your colour combinations and your patchwork ideas. I’m an Aussie and just back from the beach. I am sooo jealous you have been at the beach. It is cold and wet here in Portland and I really really really miss the sun. I love the dark colours inside the star. It looks like it’s exploding! I clicked through to comment on how broken and beautiful this one was but YOU BEAT ME TO that description! Must be an apt one. Thanks to you I have had that Doak book on my list for a year. Maybe one of my 2014 goals ought to be to actually get it and take it for a spin?! You should definitely give them a try. There is so many different ways you can use the patterns and they are all fabulous (as advertised in in the title!). Come on you know you want too. I love this vibrant star! Nice work. What do you use the dots on the pattern for? Pat I used the dots to colour code the pattern and remind myself what colour fabric goes where. This pattern was printed originally for another quilt, with a different colour way – that is why there is red dots instead of yellow.